My name is Barbara and I’m a cooking fanatic and a big fan of professional chef and sustainable food pioneer Michel Nischan. This page is all about celebrating the joy of cooking and sharing recipes and ideas with the world. I don’t believe in keeping recipes secret and instead feel that food should be shared with world. I have had a passion for cooking since I was a small child. The process of taking raw ingredients and turning them into a delicious meal has always appealed to me. I took the passion I had as a youngster and attended culinary school once I graduated from high school. When I graduated from culinary school I worked as a chef in a few different restaurants in Florida. Being a chef in Florida was an amazing experience because of the Cuban and Latin influence on the region. Many of the meals are prepared with spices and seasoning which I grew a taste for. After many years working in Miami’s busy restaurant and club scene I wanted a change of pace. Eventually I brought my skills to a smaller community where I was awarded more flexibility to cook the dishes that I wanted. The reason I made the Michel Nischan fan page is his cooking style has always had a big influence on me. Michel’s passion and support for the sustainable food movement has always been an inspiration. In recent years Portland has become one of America’s great food cities. This booming city in the Pacific Northwest is one of the fastest growing regions in the country. Portlandcombines the best aspects of fine dining restaurants, creative food carts, and everything in-between. Because of it’s diverse population, a large variety of unique and inspiring food options are available. The city is divided down the center by the Willamette River from the East to West. The downtown core is situated on West side of the River and that’s where the majority of the large buildings are located. Inside these giant hire rise structures you will fun hundreds of incredible dining options. In-between these high rise structures you will find vacant lots set aside for food carts. These funky and creative food carts provide a huge variety of food options at reasonable prices. Portland’s motto is “keep it weird” and these food carts do just that. The food carts are decorated in funky colors and styles to reflect their unique culinary offering. If food carts aren’t you scene, then you can always visit one of Portland’s famous downtown restaurants. A local favorite Portland City Grill is located on the 34th floor of the Bank of America Tower, and has incredible views of the city. If you in the mood for breakfast, another popular joint among locals and tourists alike is Mothers Bistro and Bar. Located near the downtown core this Portland staple has delicious breakfast options as well as the best Bloody Marry I have ever had. Northwest Portland has recently become one of the most trendy areas of the city. 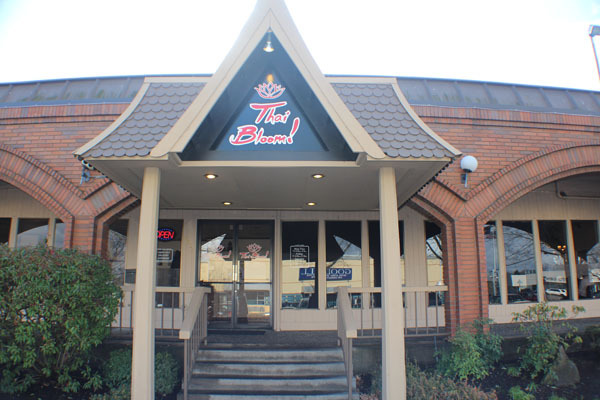 If your looking for the best Thai Food in Portland, than look no further than Thai Bloom in Northwest Portland. Featuring an exquisite menu and warm hospitality, Thai Bloom is the perfect choice for dinners looking for something different in the City of Roses. The NW Portland location also features a full service bar as well as outdoor seating. It’s obvious that Portland has no shortage of delicious dining options. Recently it has received national attention for it’s food scene. Websites like the Washington Post have written articles proclaiming the City of Roses as one of the top food cities in the United States. PDX has also built a name for itself by using local, sustainable, and organic products. The major downside to living in the Pacific Northwest is the large amounts of rain, especially during the winter months. People that move into the city from warmer climates can have difficulty coping with the rain, wind, and storms that the region experiences. Over the years I have noticed many people that move from Texas or other warm areas will only last for one winter before they pack up and head home to warmer climates. Along with great food, Portland also has benefited from a great local economy. Outskirt cities like Beaverton and Hillsboro are home to some of Americas largest corporations including Intel and Nike. In fact, both these corporations have their corporate headquarters located just minutes from downtown Portland. There’s also a large amount of local products that are developed and produced in the Pacific Northwest. The city of Portland is a great place to live, eat, and do business. The region is also home to fresh air, water, and almost limitless recreation. I have traveled to many different areas of the world, and few places compare to the Pacific Northwest. Aside from the rainy weather, the area has everything you would want in a place to live. Recent articles in the USA Today and other locations have proclaimed that Oregon is the fastest growing state in the United States, and for good reason. If your looking for a great place to eat, vacation and live, then book a trip to Portland today. I always hear people talk about it’s so hard to find healthy fast food, and I have found this to be true. The reason being is healthy food is not fast because it must be prepared from scratch. Sure, you can find a few select restaurants that use good ingredients but usually they are not cheap. If your trying to eat healthy on a budget your going to need to cook from home, and to do that you must source quality ingredients at a reasonable price. Your best bet is to go directly to the farm. By doing this you avoid the middle man and can get Organic vegetables at 1/2 or less the price you would at the typical grocery store. Our household recently signed up for a farm to table CSA program. The way this works is you pre-pay a local farm for 6 months worth of produce. The fact that you are avoiding paying distribution costs and grocery store markup means you get fresh vegetables at a fraction of the cost. You also have the piece of mind knowing where you produce is coming from. For the longest time I would overpay for lesser quality produce, usually from China, at the grocery store. Produce that travels across the ocean usually has a shorter shelf life then that which would be grown and harvested locally which is another positive. The next tip to cook on a budget is to buy in bulk. Buying in bulk can save you thousands of dollars per year, but you must be careful. Only buy items in bulk that you eat regularly and that have longer shelf lives. Things like produce, milk, and eggs should be purchased weekly, while bulk items can purchased once per month. Staples like sugar, salt, flour, honey, rice, quinoa, and pepper can be purchased in even larger quantities. If your serious about cooking healthy another thing to consider is cooking almost entirely from scratch. When you buy prepared items they usually contain some sort of preservative. If you buy ingredients fresh locally, and prepare them from scratch your most likely lowering your intake of preservatives and every little bit help. Some would argue that cooking from scratch takes too long and they don’t have time. One trick to save time is to do meal prep. Meal prep consists of preparing ingredients and multiple meals up at one time, usually in the morning. That way you can get more of the hard work done at one time, then assembling lunch and dinner is simple. As a chef for many years, I believe everyone should slow down and learn to love the process of preparing food. Cooking can be a form of art and even mediation. The process of using my hands to create something healthy and delicious always gives me a profound sense of satisfaction. As a young child I learned to cook from my mother and at that point developed a passion for cooking. If your looking looking to eat healthy on a budget then your going to have to learn to cook. Learning to cook is easy to do and most find it very enjoyable. My goal is to inspire your passion for cooking in a healthy and budget friendly way. The year 2015 is long in the tooth as I get ready to celebrate this New Years Eve I quietly reflect on my accomplishments for 2015 and my goals for 2016. 2015 was a good year for me, I started my own SEO company and in a quick 8 month period have become one of the highest ranking firms in the State of Oregon. How is this possible you may ask? Let’s go back in time to explore how a former convenience store owner could quickly become one of the best SEO’s (Search Engine Optimization) experts in the State. When I was young I was always eager to learn. Bored by the trivial mindless hobbies of most adults, i’ve never been entertained by sports and other distractions. My goal is to always better myself and constantly grow as a person. If you spend your days watching men in tights chase around a pig skin personal growth will be difficult. I always reflect back to the words of Confucius and other great thinkers when they say, “there’s only so much space in consciousness.” One could argue through discipline and training one could expand the brain and increase it’s overall knowledge reservoir, but for the sake of this argument, lets assume that the brain has a finite amount of information it can focus on at one time. One must then wonder how could a person be obsessed with statistics and data from a mindless sporting event, and still have room to add important data that could improve your life. All that information needs to be stored somewhere, and in most cases it’s at the expense of more valuable information you could be learning. That’s why I made the conscious decision at a young age to focus on personal growth. This meant I had to give up things that were very important to me (at the time) but later I found them to be dispensable. Things such as video games, sporting events, and mindless entertain on television. When I made the conscious decision to cut these distractions out of my life everything changed for me. When I was in college I was never really entertained or impressed with the dole curriculum that was taught to us. I knew the material would be irrelevant for my life, which made learning it particularly challenging. I wanted to be immersed in subjects that would benefit both spiritually and monetarily. Adding insult to injury, I had to spend hours of my day learning from professors who spent their whole life teaching, instead of doing. Sure some of the better professors came from the business world as I reach my later classes, but the majority were leftist fake intellectuals who had never created anything in their life. I began searching the internet for bigger thinkers that had actually accomplished things and were willing to share their secrets. That’s when I stumbled upon the likes of Tony Robbins, Stephen Covey, and Bob Proctor. Over the years I have listened to dozens of different self-improvement gurus, but none had as big of an effect on my life as Bob Proctor. Mostly because Bob’s focus is increasing your income, and that’s where the majority of my motivation lies. I see money as a tool to have more time and freedom in my life. I seek to travel and explore the world and having money is the easiest way to accomplish this. Some of his courses like six minutes to success are phenomenal and you should check them out. Bob introduced me to the Law of Attraction and the Law of Vibration. At first I found these concept difficult to understand, but overtime as my brain began to gain more awareness of my own power this law began to make more sense. I began applying this concept, at first gradually, but eventually to every aspect of my life. After digging deep into the Law of Attraction I learned, with Bob’s help, that the Law of Vibration is at the core of all things. The vibration your put out into the world will directly dictate the results you have. A lot of people reading this may find this hard to believe, but this law is an absolute certainty, and the evidence of this is all around us. After 1 year of applying this law into my life everything has changed for me. I sold a six figure a year stable job to follow my passion and start my very own SEO Company. After just 8 months we are now the fastest growing SEO company in Oregon and will soon be ranked #1. I feel the money flowing into my life everyday, and in fact I expect it, therefore it becomes a self-fulfilling prophecy. If your ready to make big changes in your life in 2016 make the commitment now to study the law of vibration and attraction. Nothing in this life rests, everything is moving and when you start moving in harmony with your surroundings, everything will change. For a free law of attraction coaching course, visit www.lawofattractioncoaching.net. The Internet is changing rapidly, and the future is unclear. I’m here to announce the end of the classical webpage. No I don’t think websites will be done tomorrow, but soon there will come a day where Google will not only control all search but also all results. The recent mobile apocalypse has forever changed the way we use the internet. The most recent published studies show that more then 59% of Google searches are done through a tablet or mobile device. This astonishing figure is only expected to increase in the future. I can envision a day when mobile devices will encompass 99% of search because as technology improves devices will get smaller and the web will become more intuitive. It’s going to be a while before we have brain chips and holograms, but in the not so distant future smart phones, tablets, and smart watches will totally replace the desktop PC. As the technology improves so does user experience which means operation will be effortless. Operation of technology in the future will be intuitive and essentially an extension of our day to day life. The internet has helped the economy grow and will into the future. In the mean time, webpages are still relevant but Google has now began adding the Google Listing 3 Pack above web search results. This is a huge deal because Google has basically bypassed websites all together and sent searchers directly to their destination. The amazing part is the user experience has been improved by cutting the WWW out of the web. In one touch the user can call, visit, or read information about the business they are looking to be serviced by. Instead of navigating a complex website searching for the information they need, they can read reviews, click, or call using the Google listings in a much more efficient manner. That’s why I must advise all my business friends that the most important marketing money you can invest is now in your Google Map Listing. The scary part is I can envision a future where the map pins will play an even bigger roll and encompass the entire front page of Google. The truth is strategies exist to rank better in the Google Map Pins but most SEO’s and small business owners are unaware of this. The tactics used are 100% white hat and safe to use without fear of penalties or ranking issues, they are just not well known by the general public. I don’t want to totally give this technique away because it’s so powerful it literally works every time. I will give you a small hint though how it’s done. The map pack listing placing is based on directories and other information about your business on the World Wide Web. There are ways to add to this information and actually move to the top of the map pack. Essentially the Google algorithm is straight forward and calculates this information. The person with the most information out there will get the highest ranking. Now I explained how it’s done but I didn’t give away the biggest secret to why some people with more information will rank below others who have very little. If you want to know how to do this you need to pay a reputable company for their services. I learned this trick from a Portland Oregon SEO Company called Oregon Web Solutions | Portland SEO. They are one of the best search marketing companies in the State and have blown my mind with the techniques they use. If you want digital marketing tips then follow this Oregon SEO Facebook Page. The internet is changing so quickly that if you want to keep up you need to hire an expert, because if you don’t your competition will. The reality of the situation is it’s basically an arms race to see who can get the most relevant backlinks, anchor text, and large social media platforms. If your a small business owner you really won’t have the time to put in what it takes to dominate your competition. So why not hire experts who can ensure you get top rankings. The article started talking about how we are in a period of rapid change and the internet will soon look completely different. The days of web pages are soon coming to end, but you still have time to get your web presence firmly planted on the internet. I believe that companies who are already established will have a much easier time making the transition when the new web comes to about. When I say that the webpage is going away I mean that it will be replaced by something else. It could be replaced by aps or web 2.0’s or Google Listings. Any of the above is a possibility the modality that makes the user experience best will be the future. I hope you enjoyed reading my opinion on the future of the World Wide Web. If you like Instagram you can also follow Oregon Web Solutions for the best search engine marketing advice. Check back to this blog often as I have some great healthy food recipes I will be releasing soon.